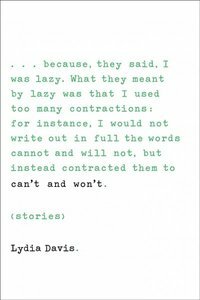 Lydia Davis is the master of the blank line: the interstitial spaces between word and thought. Her stories are so compact, I worry that they’ll implode, opening up black holes as I read in bed. She thinks, for a moment, that Alabama is a city in Georgia: it is called Alabama, Georgia. There’s nothing wrong with a gag. It’s just not a short story to my narrow way of thinking. Now that I’ve gotten that off my chest, let me talk about what I liked. [Y]ou are falsely representing your peas as less attractive than they actually are. We enjoy your peas and do not want your business to suffer. Please reconsider your art. All of the letters reveal the obsessive-compulsive nature of the narrator-writer, none more so than in the Letter to the Foundation. The narrator’s stated goal is to acknowledge a grant awarded by the Foundation. I told you right away, Frank, that I wanted to write you a letter of thanks. You told me I really didn’t have to. I said I wanted to, though. The narrator then proceeds to write a 27 page letter, a veritable treatise by Davis’s standards. She (the narrator) recounts every event of her life from the time she first learned of the grant, now 20 years ago. She does so in the conviction of performing a duty well. I will try to reconstruct this experience for you, since you asked. Story from Flaubert marks another series. Davis has translated and slightly reworked correspondence written by Flaubert while he was working on Madame Bovary. My favorite is The Chairs. Davis uses paragraph breaks the way the rest of us need words to show the passage of time. The Cows is a series of observations of the cows in the field next door. The silence between the paragraphs tell us that action has taken place. The cows have moved or the narrator has shifted her gaze or the day has ended. That’s a pretty thrilling way to use blank spaces. They amble into view from the far side of the barn with their rhythmic, graceful walk, and it is an occasion, like the start of a parade. The same device is at work in my favorite story, The Dreadful Mucamas. The Mucamas are servants. They came with the house a woman and her husband now rent in an unspecified city in South America. The lady and her servants do not yet see eye to eye. Luisa, I say, I want to make sure we understand each other. You cannot play the radio in the kitchen during our dinnertime. There is also a lot of shouting in the kitchen. We are asking for some peace in the house. The lady is irked: the toast is too crisp, the ironing never done on time, her undergarments left unwashed. We also think they may have relatives living secretly with them behind the kitchen. Here, the paragraph breaks do not connote silence or the passage of time or a shift in the horizon. This is war.